The Old One is really out to get your soul this Halloween weekend, increasing the rewards possible if you play Demon's Souls online. 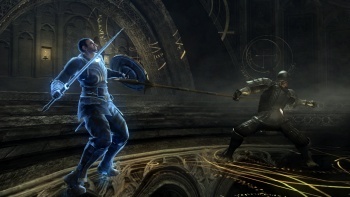 If you've been playing Demon's Souls and want a challenge, play the game online this weekend. Atlus has announced a Halloween event where it will be plunging the game's worlds into pure black tendency. This means that enemies will be stronger, while you will be weaker. Of course, there has to be a reason to put yourself through the hell of making a really hard game even harder. In Demon's Souls, a pure black tendency also means that the loot rewards will be greater. Though I'm not terribly deep into the game myself, having only beaten 1-1, 1-2, and 2-1 (I know, I'm slow), it is said that there are secrets in many areas that are tendency dependent, so this will be a chance to search for those as well. I was just thinking that it would be great if Atlus provided some kind of DLC for Demon's Souls, and along comes this event. This is what makes Atlus such a great company; it is in touch with its fans and knows what they will enjoy. In the past Atlus has held other events, such as a multiplayer tournament for Luminous Arc 2, a game that maybe didn't click with a huge amount of people, but the tournament was still a cool idea nonetheless. If you don't mind spoilers, and just want to figure out the best way to maximize this event, the Demon's Souls wiki would be a good website to explore. Black tendency should kick in sometime this weekend, just make sure you bring lots of Moon Grass and your strongest weapons.